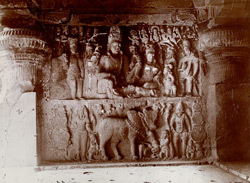 Photograph of sculptures in the Ravana ki khai cave at Ellora, taken by J. Johnston in the 1870s. The spectacular site of Ellora is famous for its series of Hindu, Buddhist and Jain cave temples excavated into the rocky façade of a cliff of basalt. The works were done under the patronage of the Kalachuri, the Chalukya and the Rashtrakuta dynasties between the 6th and the 9th centuries. The cave known as Ravana-ki Khai is a single-storeyed excavation dating from the 7th century and consists of a square columned mandapa and a verandah. The facade has lost several of its piers revealing the large pillared hall behind. Large figural panels of Shaivite sculptures decorate the south wall and Vaishnava images ornate the north wall. The panel in this view represents Shiva and parvati seated, playing dice, in their home on the Kailasha mountain. In the lower register the bull Nandi plays with semi-divine beings, ghanas.